Costing a staggering amount of 63,000 dollars, this statue is one of the most offbeat attractions to see in Budapest. The statue is of Peter Falk who played the role of Colombo from the year 1968-2003 so it only fits to take him as a representative of the famous detective. What is even more amazing is the basset hound that accompanies the statue. It is basically a bronze statue that has an unanswered urban legend around it. It is said that Peter Falk was related to Miksa Falk, an extremely famous Hungarian political figure. It is still not confirmed whether they were actually related but there’s a chance that a connection exists there as the street on which the statue is present is named after Miksa Falk. You can visit the statue anytime of the day. How popular is Columbo Statue? People normally club together The Dreschler Palace and Victor Vasarely Museum while planning their visit to Columbo Statue. One of Budapest’s newer statues and certainly a favourite with passers by. The statue is on Falk Street but other than that there’s no other link between actor and location. The dog is a nice addition and it’s a pretty good likeness of the famous detective. Keep an eye out for the tiny dead squirrel with a chalk outline nearby. Columbo is the best. Although his dog is next to him it's not modelled on the one in the TV series. If you go there pat the dog's head . Very impressed by the dog, as I'd forgotten Columbo had a dog. It was like they made the dog then had a bit left over for the Columbo, very big dog, actual size Columbo. I offered the dog some chimney pot, a local delicacy of pastry. The dog seemed like he'd been fed (possibly over fed). Columbo just seemed very confused by it, which I was shocked about because he had been in the local area for a number of years and his professional was that of detective. Apparently the Falk family lived in Budapest, naturally a statue had to be erected. If you ever watched columbo, this statue commemorates him in his common TV persona pose. He is flanked by an obedient basset hound as well. Good picture op for kids too, they love the dog. 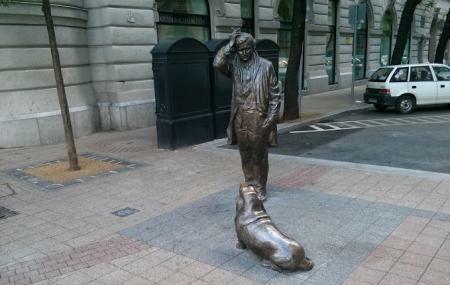 Love the Columbo statue. Don't forget about the dying rat holding a gun right behind Columbo.